6:50 Commuter train pulls into northern New York suburb. 7:00 Two parents drive home, walk into house, shout “hellooooooo?” Wonder where kids are. 7:01 Reminisce briefly about the days when kids were at home waiting for them. 7:02 Reminisce briefly about the days when the kids, not the puppies, jumped on mom or dad when they came home from work. 7:03 Reminisce briefly about the days when one kid ate nothing but pasta and pizza. 7:10 Dance same old dance: What do you want to eat? What are you in the mood for? I don’t know should we go out? Sure. Where? I don’t know. Are the kids even eating with us? Let’s just cook in. In case we have to pick them up. OK so what do you want to cook? I don’t know what do you want to cook. Do we have anything? 7:12 Looks in fridge, spies a bunch of kale and enough prosecco for two Aperol spritzes. Looks in pantry, spies a few cans of Great Northern white beans. 7:15 Mix up spritzes; Pretend they are still on vacation. 7:30 Sauté garlic, onion, red pepper flakes in olive oil. Adds beans, kale, herbs. Then, off heat, lemon, parm. Thinks about tossing with pasta, instead toasts some frozen baguette slices from the freezer. The recipe as written makes four side dish servings. If you stretch out with a half pound of pasta, or a few baguette toasts, it serves four as a main. If it’s late August, an ear of buttery salty corn alongside of this would not be a bad thing. Add 2 tablespoons olive oil to a large skillet set over medium heat then place garlic halves cut side down, swirling them to infuse the oil. Remove after about a minute, once garlic becomes fragrant. Add onion, salt, pepper, red pepper flakes and cook until onion is slightly wilted. Add kale and cook another 2-3 minutes until greens shrink. Add beans, remaining olive oil, and butter, tossing until beans are warmed through and butter has melted. Place beans and kale in a serving bowl, and toss with lemon juice and Parm. If serving on toasts, smash them a little in the bowl so they don’t spill off the bread. How to make an Aperol Spritz, from the back of the Aperol bottle: 3 parts prosecco, 2 parts Aperol, 1 splash soda. View of Taormina beach not included. this, tossed with pasta is one of my favorite weeknight dinners. easy, fast, healthy, delicious. 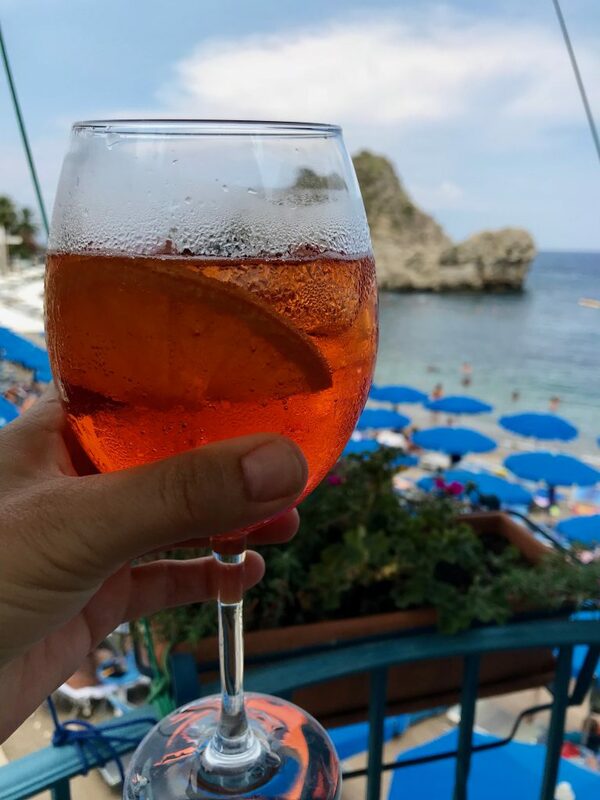 I discovered Aperol Spritzs while in Italy this month. And then quickly started drinking them as though they were going out of style. I’m not even sure if I like them that much, but they were just so vacationy. If my body can’t handle acidic or spicy foods (so I’d have to leave out the red pepper flakes & the lemon), is this still worth making? Would there still be enough flavor? Also, can you convince my children to eat onions, beans, or kale? Well, I don’t want to say omitting those two ingredients wouldn’t affect the overall flavor, but if you are used to things not being acidic, I’m sure it would be fine. Maybe add extra Parm for bite? I’m not ready for this. Have watched these two kids (roughly the same ages as my two kids) grow up on this blog. Not ready for these kids to grow up and be independent and not even home for dinner. Because I know this is my future. Love this dinner suggestion. Keep fighting the good fight, Jenny. TELL ME ABOUT IT KIM! Lol, thank you for reading all these years. Grill bread on both sides till crispy…lightly swipe cut garlic on one side of bread. In saute pan on medium heat, toast sliced garlic in oil until light golden, add chili flakes, cooke for ten seconds, then add basil leaves. Do this carefully, as the basil may splatter some oil. Pour beans in pan…I use some of the liquid in the can…mix together…add more bean liquid if necessary. When basil leaves are wilted, remove mixture from heat. Add sun-dried tomatoes and chopped parsley. Squeeze fresh lemon to taste…add salt and pepper. 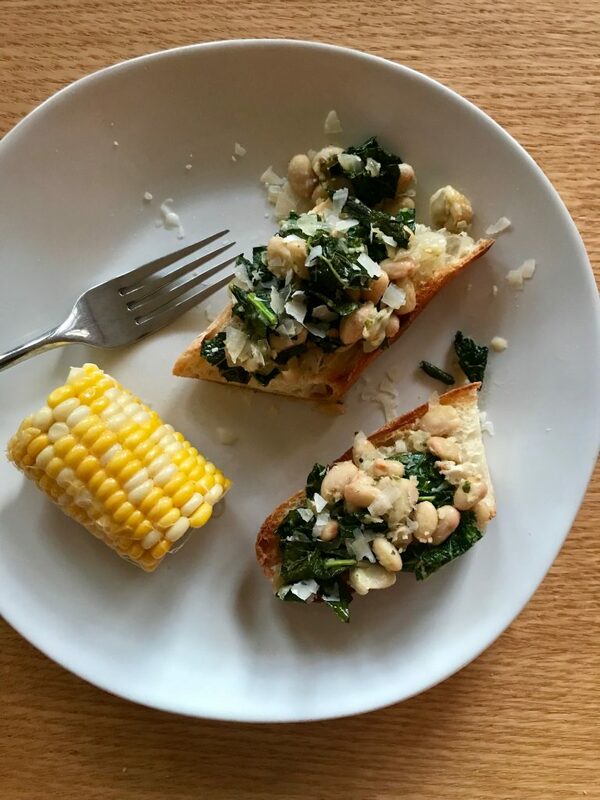 The rest a no-brainer…heap on toasted bruschetta…slick a little olive oil over top if desired, then add a bit of ricotta salt cheese over top if using. FABULOUS!!! 🙂 In an effort to “round out the meal with some healthy greens” I usually buy spring-mix greens to accompany, but rarely bother to spend the extra two minutes to put together. After all…I know darn well I’ll be making some butter-drenched popcorn later in the evening! By the way, every time I look at this photo, it reminds me that I should’ve waited a few minutes before taking it. Because once I served myself this dinner, I drizzled olive oil all over it and it looked so much more beautiful and delicious. Anyway, just thought you should all know. Made this to take for lunches, and it reheated surprisingly well! Omg it is definitely a more than the sum of its parts meal…. it is SO good! So easy, quick and cheap as well. Thanks for sharing!